Over at Igglesblitz today, Tommy Lawlor mentioned that QB play and coaching are much more important than people realize, specifically citing the Packers defensive performance and record for 2010 and 2011. Basically, the defense got A LOT worse while the record got better. I figured I’d add some stats to the point to further illustrate it, because it’s both true and very important. Unable to quantify coaching, we’ll focus on the QB. 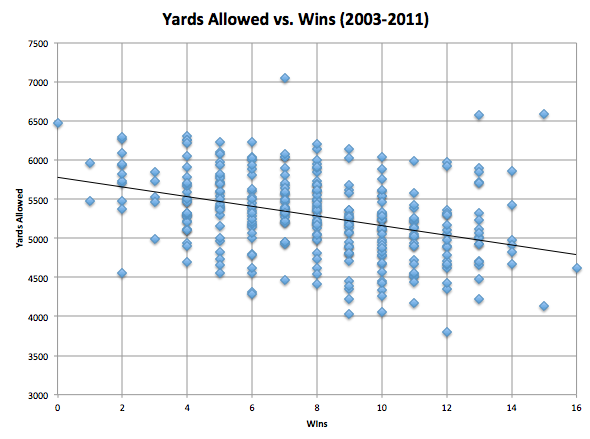 Here are the charts for both Passer Rating vs. Wins and Yards Allowed vs. Wins. This is particularly relevant given the Eagles current situation, with QB uncertainty and a defense in need of serious upgrades (or significant improvement in current players). In general, the play of Vick/Foles/Rookie? will be MUCH more important than the performance of the defense next year. Another somewhat counterintuitive truth (at least regarding the magnitude of the difference in importance). It also means the Eagles could use this draft, free agency, and scheme change to engineer a dramatic defensive improvement and still end up out of contention if the QB play isn’t good. 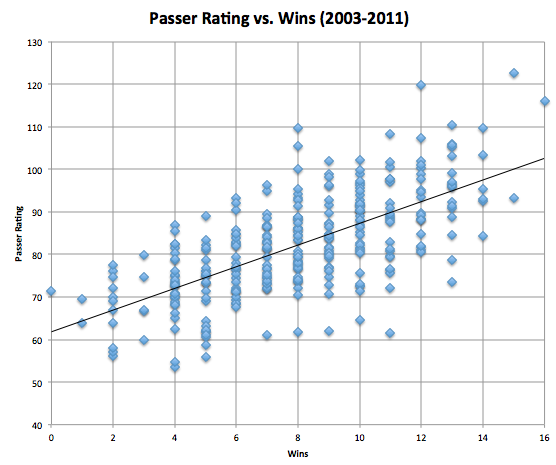 Very strong correlation for the Passer rating vs. wins chart. Great stuff. But yards allowed is not that accurate a measure of defense. The other thing is that the QB position is effectively fixed in many cases. That is, absent a great draft class and corresponding draft position, the range of available QBs is only so wide. There is no benefit in churning through second rate QBs. So in such cases you do the best you can, which may in fact mean upgrading your defense is the best you can do. Good points. Regarding the last part, I didn’t mean to suggest the Eagles shouldn’t bother improving the defense. Doing so will absolutely improve the team’s chances at a title (obviously). Also, take a look at the draft posts and you’ll see I am pretty set against reaching for a need (i.e. QB this year). Yards allowed isn’t perfect, I agree with that as well. I’ll take a look at turnovers forced as well as a few other measures and post them too. I appreciate the feedback, thanks.